All I can say is: And Zoe thinks I'm sarcastic. Not that I let her watch when TV's most sarcastic mother returned to TV in the Roseanne reboot Tuesday. But I watched it. Partly because of the hype. Partly because I had watched the show when it originally aired in the late eighties/early nineties. But also because I've never quite made up my mind about Roseanne Barr herself. I was a teenager when Roseanne premiered the first time around, and though I found it funny, what mostly got my attention was how much the Conners argued and yelled. The first time I watched, I remember Becky fighting with Roseanne and finally yelling, "I hate you!" before stomping up to her bedroom. I was shocked by this. No one ever would've said that in my house. It was unthinkable. But then came Roseanne's response, which shocked me in a different, almost revelatory, way. She said, "Good. Then I'm doing my job." It still resonates with me today as maybe the best response, to remain completely unperturbed when your child or teen hurls some unreasoning emotion at you, to let them know that you're not going to be bothered by their nonsense and won't be swayed. And maybe throw in some sarcasm for good measure. After all, as I like to say, Mockery is the highest form of love. This is not to say that my mom style is Roseanne Conner. For one thing, that would take a lot more commitment. I tease Zoe but I don't want to make her cry. Or at least only when she needs it for personal growth, as in: Crying doesn't work on Mommy when your goal is to eat all the candy while playing all the Minecraft and doing none of the homework. Back to my ambivalence about Roseanne. I've always felt like I was supposed to like her, just by virtue of her being a strong female comedian. On the other hand, she's, well, she's Roseanne. Crass and reveling in it and somehow---call me crazy---I get the feeling she'd be a little too much Roseanne to be around all the time. Plus, as a mom, I don't want to be an unrelenting sour note. I've always appreciated her comic style, the cutting through crap to expose a truer if oftentimes uglier side of things. However, I wonder if, as self-aware as she seems to be, is she quite aware of the extent of her own crap? I've always had this default position where I assume self-deprecating people have built-in wisdom, but that's not necessarily true. 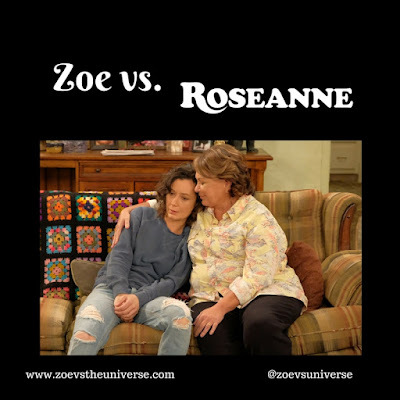 In any case, Roseanne Conner is not the kind of mom I really want to be for Zoe. Even if I have a wry to fatalistic view on life and its absurdities, I think it'd probably be good if a seven-year-old has a rosier view. At least until she's in high school. If you enjoyed this post, you may like this walk down TV memory lane when Zoe takes on the Fonz. Bring your trademark cackle. Click here to subscribe.